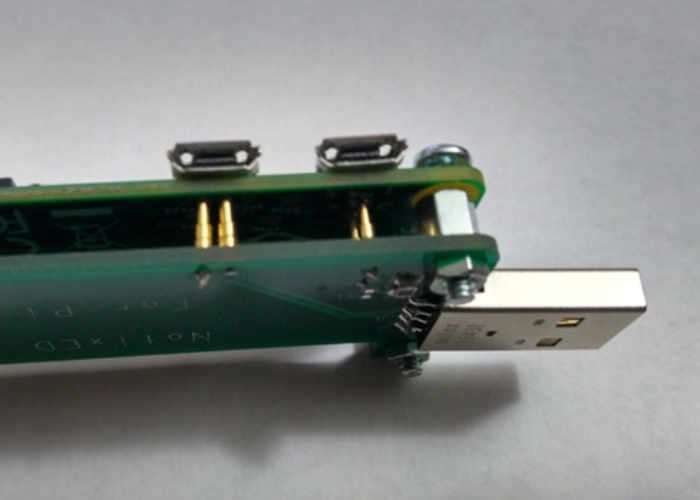 Developer Vikas Shukla has created a new Raspberry Pi Zero USB adapter which is available to purchase from just $4 and is available via the Kickstarter crowdfunding website. The small adapter simply bolts onto the bottom of your Raspberry Pi Zero without the need for any connector, cables or soldering and adds USB functionality directly to your Pi Zero mini PC in minutes. Check out the video below to learn more about this quick way to word USB functionality to your Zero. Notixed is a simple solution for Raspberry Pi Zero. No need for a power supply, a keyboard, or any micro usb adapters. With the $3 Notixed, theres no hassle to buy a variety of components from different places. Everything you need in three dollars. NotixED works by plugging into a computer, or a laptop. The computer will recognize NotixED as a USB device. If your on windows there’s even an app installed so that you can run the GUI. Involving Hardware, NotixED connects VIA pogo pins. That means no need to spend your time soldiering. For more information on the new Raspberry Pi Zero USB adapter jump over to the Kickstarter website for details by following the link below. If you enjoy building Pi projects you might be interested in our comprehensive list of Raspberry Pi displays, HATS and small screens.